Doodling at your office desk is fun, because if you’re doodling, it usually means that you’re not working. Just think how amazing it would be if you had a desk that was made to be doodled on… The only problem is that your productivity would really suffer if you had a desk like that… or would it?! Believe it or not, there’s quite a bit of evidence that suggests doodling at your computer desk can make you more productive. An article in The Lancet, a leading neuroscience journal, discusses the psychological and medical concepts behind these benefits. Here are some of the things we took away after reading this article. If we put aside our opinions on politics, we can hopefully agree that a person has to be at least relatively intelligent in order to sit at the Oval Office desk. That’s why it’s worth it to point out that over half of the Presidents in US history have made a habit of doodling at their desk. And we’re pretty sure that if President Franklin D. Roosevelt had been lucky enough to work at a high-tech standing desk like an UpDesk UpWrite, he would’ve used dry-erase markers to sketch out strategic plans with General Eisenhower. And we’d guess that those 26 Presidents also doodled at their desk just to stay focused while their staff briefed them on the more mundane aspects of running the country. Doodling at your computer desk can alleviate undesirable mental states like boredom and indecision. Perhaps you’re simply sketching up the pros and cons of a certain decision (like whether you want to buy one UpWrite or two), or perhaps you’re just relieving stress. Either way, doodling seems to serve a similar function as less-productive habits like biting fingernails or tapping your feet. But instead of just being a nervous habit, doodling is also keeping the important portions of your brain alert, which is why it can be so beneficial in the workplace. Don’t forget: Doodling improves short-term memory. No matter our field of expertise, we’ve all been in situations where we’ve had to remember a series of information. Maybe it was a list of people to invite to the quarterly sales meeting, or maybe it was a list of running backs we wanted to draft for our fantasy football team (not that you’d EVER hold a fantasy draft at work). Psychologist Jackie Andrade suggests that doodling keeps an ideal level of attention by preventing us from daydreaming or completely losing focus during monotonous tasks like keeping track of a repetitive list. You might not be sitting in the Oval Office (or maybe you are? ), but it’s still important for you to be able to focus at work. 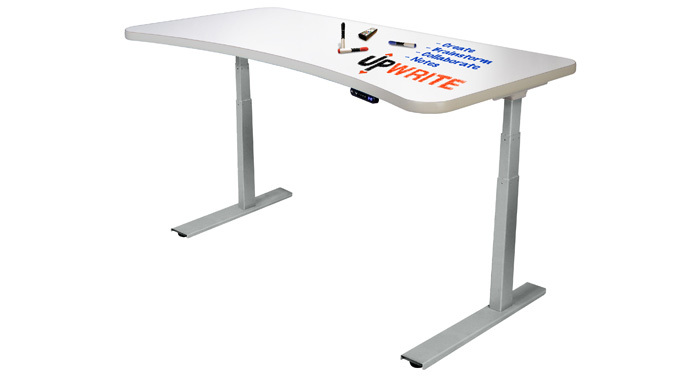 If doodling is your preferred method, consider an UpDesk UpWrite for your next computer desk. Not only can you improve your productivity by doodling on your desktop, you can improve your health by standing at your desk throughout the day. And that’s good for focus, too. Happy Doodling, and Happy Standing!